There is much fanfare about the recently inaugurated Mecca Clock. It is now the world's largest clock sitting on top of the world's second tallest building - and is visible from a distance of 16 miles (I haven't checked the math on this - but this is what is reported). 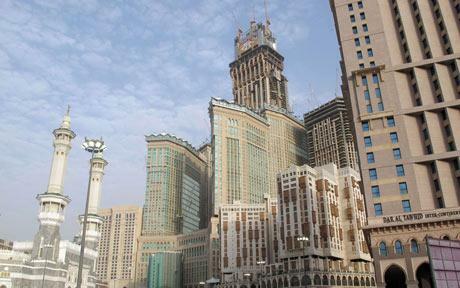 I have my own personal objections to having sky-scrappers around a spectacular mosque located in a desert. Perhaps, this is coming from my experience living in New Mexico, but I would guess that the pilgrims would favor looking at an open sky rather than tall buildings. But fine. That is a personal opinion on sky-scrappers in Mecca. 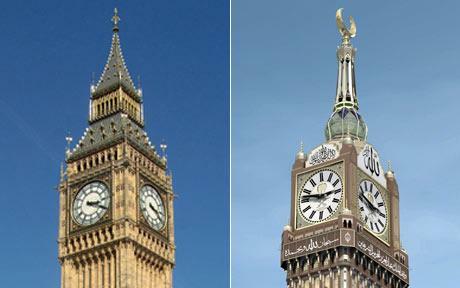 If one wants to build a gigantic clock - so be it (right, a comparison with the Big Ben). But the more amusing part comes from the claims by some that Mecca time should replace the Greenwich Mean Time (GMT) - because the latter is a remnant of colonial heritage. Hmm...but even if we buy into that, why should it be replaced by Mecca time? Because there is a gigantic clock there?? The reason that the meridian is 0 at Greenwich is because it is the British that solved the longitude problem. Therefore they got to reference a part of England as the main reference point. Names associated with science are often, if not always, symptomatic of the scientific power of the time. Therefore we see that many of the elements discovered in the 20th century have names such as berkelium, americium, californium, etc have American names (though sometimes there were competing claims from Soviet laboratories also). Discover things or solve problems and ye shall have the authority to name things. Heck - more than half of the brightest stars in the sky have Arabic names. This is because Arabic atlases from the medieval time played a key role in the development of modern astronomy - and Arab science was dominant at the time. It is perhaps a bit immature to ask to change an established world system - simply because one has built a big toy. Do something worthwhile in science and then you will have a chance to name things also. But there are no shortcuts. This requires a serious investment in science and more importantly in creating a scientific minded culture. And talking about the lack of scientific culture, one of the justifications given for the adoption of Mecca Time is that, according to Yusuf al-Qaradawi - an Egyptian cleric, Mecca is in "perfect alignment with the magnetic north pole", making the city a "zero magnetism zone". What the heck is he talking about?? Since Earth has a magnetic field, it also has magnetic poles - points where the magnetic field lines point 90 degrees (south or north). The origin of Earth's magnetic field is still as yet an unsolved problem - but the most likely reason is the dynamo effect. But one thing is clear: the magnetic poles change their locations constantly (in fact, poles are also known to reverse over long periods of time and have reversed about 170 times over the last 100 million years! This discovery has played a fascinating role in confirming the idea of plate-tectonics. You can impress your friends with this tid-bit of information to impress your friends). So one might ask, what is the current location of the magnetic north pole? It seems that it is currently in northern Canada and moving towards Russia at 40 miles per year (magnetic south pole is also moving in Antarctica). Okay - so unless one wants to move Mecca at a similar speed, it may have a hard time keeping WHATEVER alignment Yousuf-al-Qaradawi is talking about. But but then there is also a more basic question: Shouldn't a whole line on a sphere be affected in the same way from a point on a sphere? I mean, the magnetic field lines are relatively symmetrical. So whatever field Mecca has, it should extend to a whole line equidistant from the north magnetic field. Of course, this is all a waste of time. The urge to show Mecca's specialty in a scientific language has nothing to do with reality. This is in the same line as Muslims trying to find nuggets of modern science in the Qur'an. Creating scientific institutions takes time. Creating a valuable scientific culture takes patience and persistence. The reality is that Muslims at present lag in science. These pseudoscientific efforts are a short-cut to make Muslims (and yes, these kind of "proofs" with this kind of evidence can only be accepted by believers) happy in a make-believe (yes, pun intended) world. Science, the way it is practiced today, unfortunately places emphasis on evidence. Perhaps, Yousuf-al-Qaradawi can make up his own rules to understand his own physical world. Critiquing I'jaz - The claim of "scientific miracles in the Qu'ran"
To be honest the main problem Mecca Clock poses to me isn't about its pseudo-scientific claims or ugly architecture: but its very existence. It's a terrible show of power, a mountain of irony: the human "pride" on the back-drop of the small, simple, asymmetrical cube that Muslims call "House of God"... thus it is almost mocking the very thing that makes the city important for Muslims... just like you mentioned, it wants a respected spot in the realm of science without actually working to earn it; but it goes beyond that: it tries to achieve the same spot in the realms of theology, architecture, modernity, politics - without actually doing anything in those fields either. At the end I can't help but think a bit Freudian about the recent sky-scraper-race in the Arab lands... especially when they serve to no purpose other than making a joke of themselves. Nice write up... And I totally agree with Kubra here. 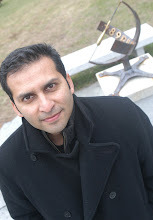 On a larger scale, I completely agree with you - and I really like your perspective on "the human "pride" on the back-drop of the small, simple, asymmetrical cube that Muslims call "House of God"". I was trying to use this example to look at the way some of these guys (and yes, there are mostly guys...) understand science. But yes, I hope more people are appalled simply by the presence of this gigantic toy. I don't think you understand or differentiate between Islam and how Saudis or some people in the Arab states of the Persian Gulf think. It has nothing to do with science or Islam for that matter. It is a failed attempt to advertise how Saudis (not the people but the royal family) do all what they can to serve mecca. This time, they serve it and serve Muslims by finding an alternative to Greenwich. Another possible explanation which again has nothing to do with Islam is the clock is a reflection of the growing pattern or obsession people in the Gulf have to have the "biggest", "tallest", "largest" etc. (there are plenty of examples from the Gulf the most famous for westerns are those in Dubai, Abu Dhabi and Qatar. There is nothing wrong with borrowing science or piggybacking on other ideas. Also, people don't have to wait until they achieve scientific advancement to establish standard that fit their culture. Boosting prestige can be a prelude to scientific development. You have to start somewhere, and beating ourselves up because we lag behind in science won't help. Other than that, I agree with you completely on the pseudoscientific efforts that are so prevalent in Islamic culture. "Boosting prestige can be a prelude to scientific development. You have to start somewhere, and beating ourselves up because we lag behind in science won't help." Oh absolutely. Look at Iran touting its stem cells institute. The proposed green technologies in UAE. Heck - even the nuclear technology (though I have personal issues with this one). Or to celebrate Nobel prize winners like Abdus Salaam and Ahmed Zewali. b) There is an idiotic proclamation regarding "zero magnetic field" or that is the "center of the Earth". My point is that the above claims are laughable and do not serve any positive role in increasing prestige. In fact, by not standing up to this, we may legitimize such a level of mainstream pseudoscience. "I don't think you understand or differentiate between Islam and how Saudis or some people in the Arab states of the Persian Gulf think." I actually did not say any thing about Islam. It was all about the claims made by the people associated with the clock. "Another possible explanation which again has nothing to do with Islam is the clock is a reflection of the growing pattern or obsession people in the Gulf have to have the "biggest", "tallest", "largest" etc." This is a good point. And building the largest clock has exactly the same impact as building the tallest building (especially if one hires an international firm to build it - without impacting the local engineering or architecture programs). Hmm. Perhaps one of Turks here can do a good job of translating a saying that fits. & his scientific knowledge, pride for scientific discoveries and his happiness for these achievements and his scientific culture …… u r getting me no…..